The annual ARRL Field Day (FD) has always been a favorite operating activity for me. I favor FD operations that are truly remote, trips that combine backpacking with amateur radio. 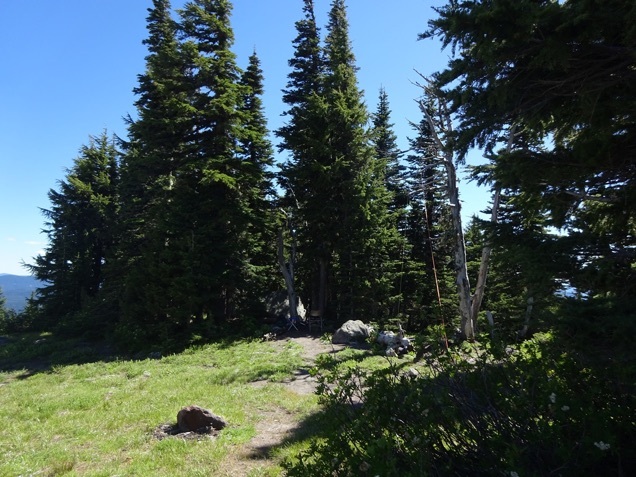 These kinds of treks are, however, becoming more difficult. Not only are my kids (hiking partners) pretty busy with their own activities, but I'm getting older, generating a limit on the places we might go. 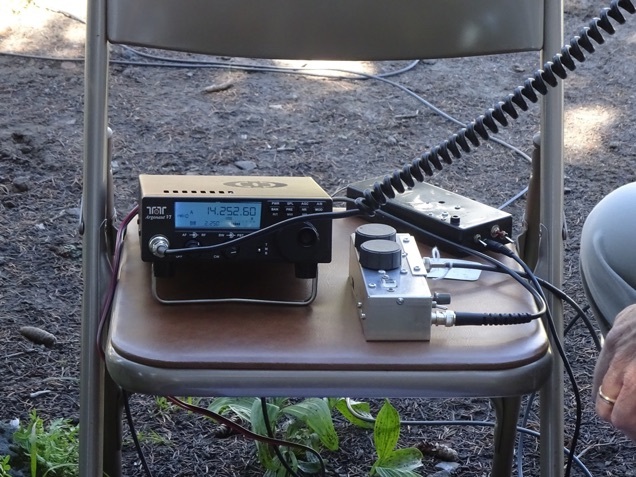 My good friend Bob, N7FKI, has a more civilized take on portable operation. 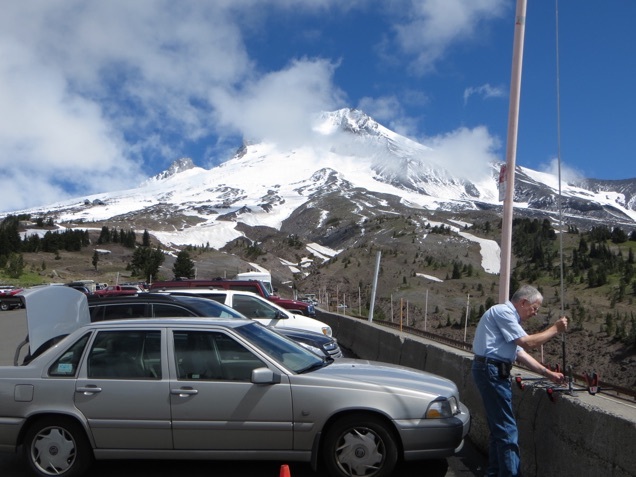 His approach to a good FD junket is to drive to a scenic location and erect an antenna that can be used while operating in the driver's seat of his car. He may also succumb to using a nearby picnic table, if available. Bob and I have done numerous FD operations, but always from one of many local parks or school yard. This year, we decided to drive to Mt. Hood and see what would happen from the parking area there. 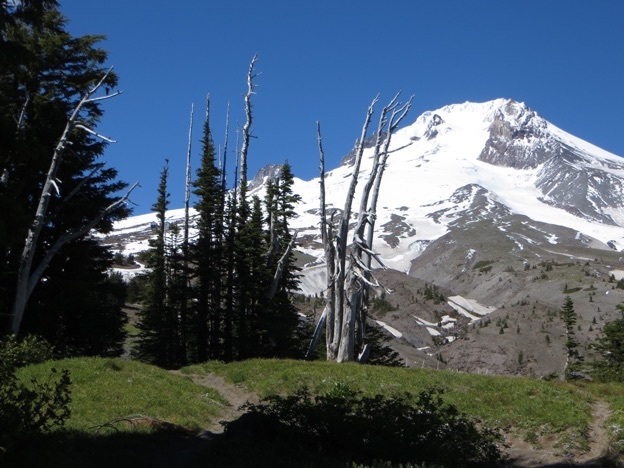 We still have some plans for mountain hikes with the rigs, perhaps for a SOTA activation. We headed out with the goal of arriving at Mt. Hood's Timeline Lodge at the official 11 AM FD set-up time. The parking lot is about a 1 1/2 hour drive from our house in Beaverton, OR. We made it with time to spare and proceeded to set up a vertical antenna. It was attached to a cement barrier at the edge of the parking lot. We decided to abandon the vertical and operation from the car in favor of a new location in a nearby meadow. The site was close to the edge of the parking lot. It was just enough over a hill that we still had a view of the mountain, but saw none of the sea of cars. This is the shady stand of trees where we set up operation. This is the view that we saw from our operating site. It's been quite a few years since I've seen the weather that clear on Mt. Hood. We set up a 20 meter half wave dipole in a tree close to our operating position. The dipole immediately seemed much more effective than the vertical, even when only 20 feet or so above ground. (N7FKI photo--tnx Bob) This shot shows our operating "table," a folding chair that Bob found in his car trunk. The rig was a Ten Tec Argonaut-6 powered by a 7 Amp-Hr 12 volt SLA battery. The other items are a homebrew transmatch and an electronic keyer in a plastic box. We ran the rig at the 10 watt limit. 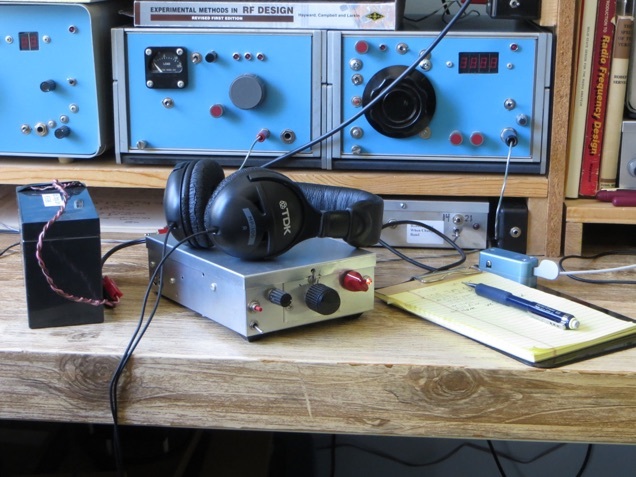 Both 20 Meter CW and SSB seemed to be effective, providing us with numerous contacts all over North America. We finally ended our N7FKI-FD operation when we were greeted by a chilly albeit refreshing breeze. I awoke on Sunday morning, still wanting to be on the air. The end of FD on Sunday is always a productive and fun period so I set up a portable rig and ran in the "1E" class with emergency power, using my own call. The setup is shown below. This little 1 Watt CW transceiver with battery power provided another dozen contacts before the FD event ended. As always, I came away with a desire for more Field Day, or at least some more portable activity. There is always next year.... Many thanks to Bob for a really enjoyable Field Day.